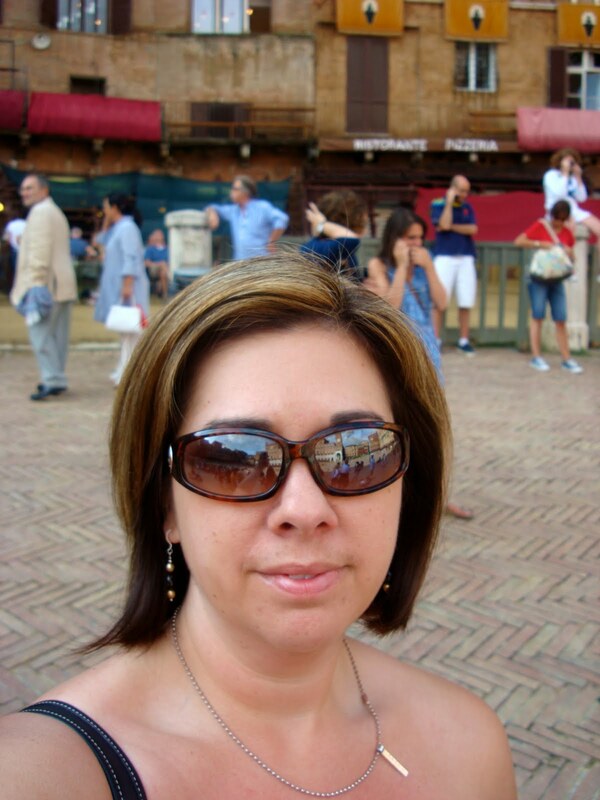 Art Talk: Ciao! 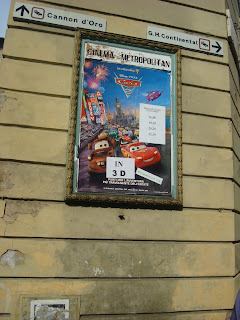 Arrivederci Italy! We left very early on June 30th. Matt, of course has to get to the airport way too early because he's petrified we will be late or something major will happen there if we don't. So, we get through security with no problem because we are one of maybe 20 people in the entire airport at 7am! Our plane doesn't leave for 2 more hours! So, we get to the gate and decide to have coffee and breakfast and the little snack shack in the terminal. Our hometown airport is not very big, but they have FREE wifi... so I was happy browsing the internet and purchasing books on my ipod touch for the trip. I also fully charged it so that it wouldn't need charging until we got to Germany (which is where we picked up the flight to Florence). Very pleasant and quiet time spent before boarding. Got to Chicago and made it to our gate early again. We went and got lunch at the Tuscany Cafe (very appropriate) and I enjoyed a minestrone soup and panini sandwich. We got a bottle of wine to pass the time too. Very relaxed and happy were we. The next flight was the longest (8+ hours) over the Atlantic Ocean. Matt needed that bottle and more to relax. He is a very nervous flyer. Not me... I love to fly! We met a couple that were in our group there. Tom and Cheryl were from St. Louis. It was nice chatting with them at the gate. We flew business class... whoa! I don't want to fly any other way now. The seats were HUGE and we arrived on board to a glass of champagne and out own private movie screens built into the back of the seats. The seats actually reclined into a bed! Although I didn't sleep one wink. Matt slept 4 hours, but I was too excited to sleep. I got out my journal and went to town. It was great! Once we got to Frankfort, I was tired and needed some coffee pronto! This was a short and small flight. 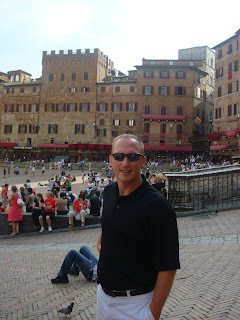 Once we got to Florence, we had to take a van to Siena to where we were staying. 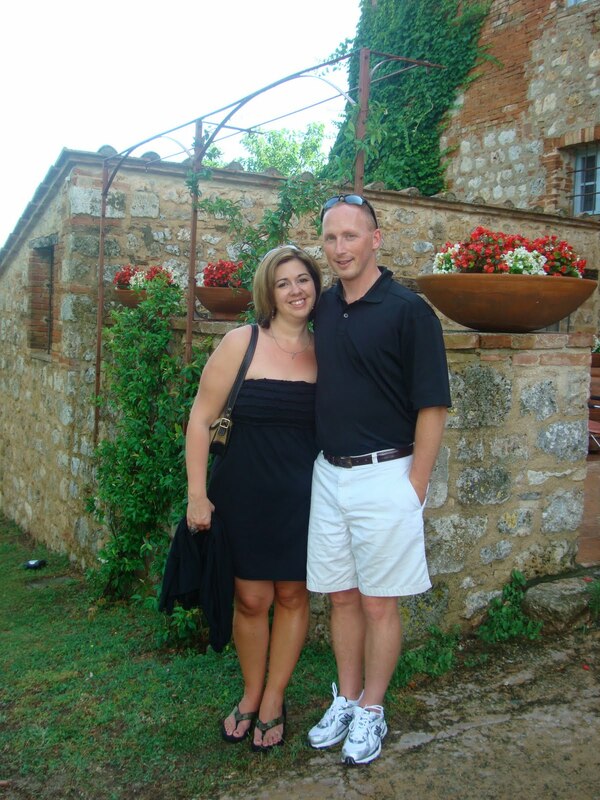 Here is a photo of us outside the estate. All stone and probably pretty old! It overlooked the most beautiful scenery I have ever seen. 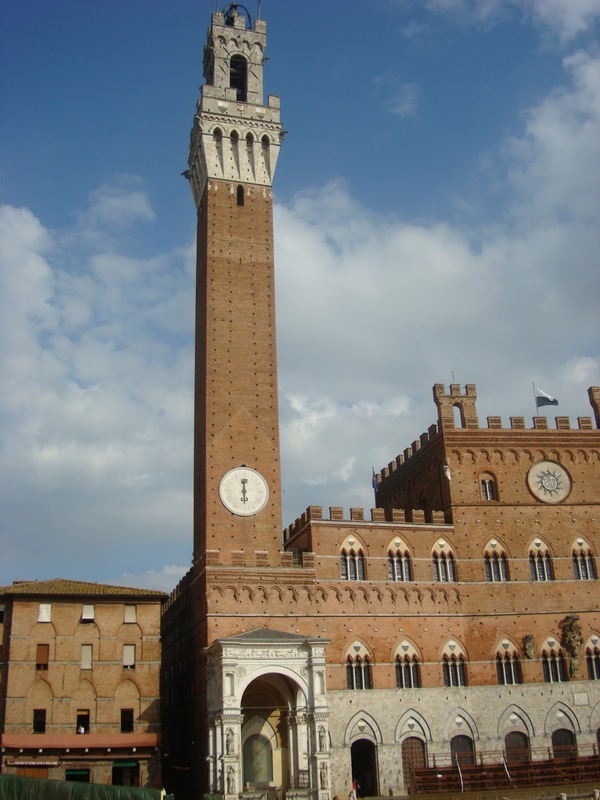 The mountains of Chianti could be seen along with vineyards, olive groves, cypress trees and spotted with other stone houses, estates, and even a castle or two. Gorgeous! It's no wonder artists flock to Italy to paint! It's inspirational! We had some time to ourselves while we waited for the others to arrive. We met another pair... Matt and his dad, Mike. They were from Kentucky I think. Matt took a nap while I went down to the gorgeous pool area. I took a quick dip and as soon as a sat to enjoy the view, it started storming. My luck! It was very cool though to see the storm sweep across the mountains/hills and over the landscape. We had lunch inside and enjoyed wine, caprese salad (the tomatoes were the sweetest I've ever tasted! ), cantalope, cheeses, and salad. I was so content! 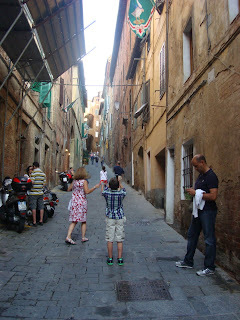 Once the others arrived, we changed and went to Siena for the night. We toured a bit and had some wine at a little outdoor seating of a restaurant. Fun to meet everyone and talk about where we were from and what we do. 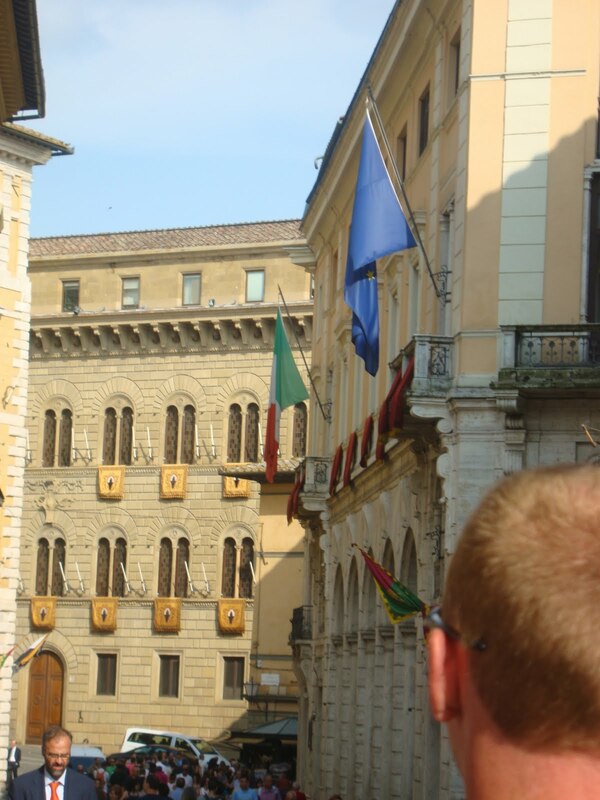 A side street with a contrada flag. 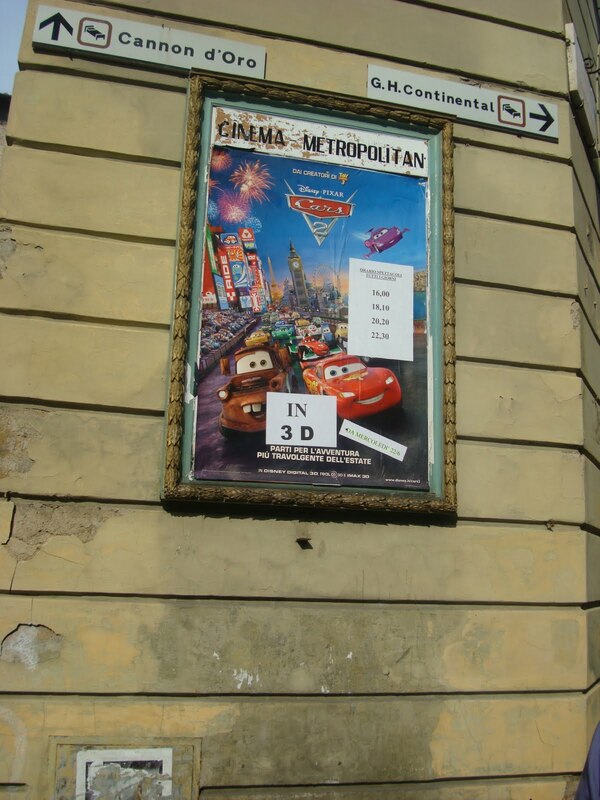 Cars movie poster in Italian - My kids would love that! The first bank of Siena - started by the Medici's. Heads of the bankers??? Not sure. But I think it's funny to think so. This is the back view of the bleacher seating. You would pay $500 per seat! Balcony seating... we are going to be in one. VERY expensive to get and the best seats of the house! Cool brick pattern... reminds me of Chevron patterns that are hot right now in art. The forest contrada flag and starting point of race. Beppe, who was our representative from Ruffino. He acted as our translater, guide, and anything else we needed. He is amazing! Thanks! A better view of the hill down. 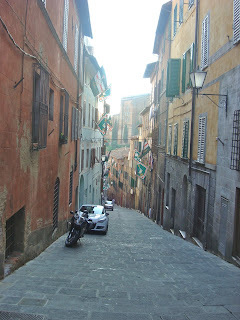 We had to climb up after much wine consumption! Whew! Oca contrada's tables set for the dinner! 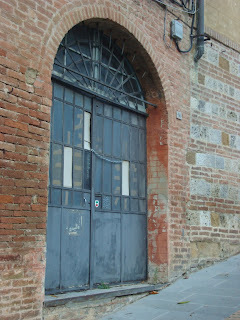 A very cool door... I'm kind of obsessed with doors in Italy. The first church in Siena. Overlooks the water supply. Waiting for seating at the dinner. Another view of the people waiting. The dinner with the head table seating the important people... jockey and officials/ leaders. A closer view of the head table. Here is a video clip of them chanting and singing about the race and their horse. The horse's name was "Mississippi" by the way. LOL! 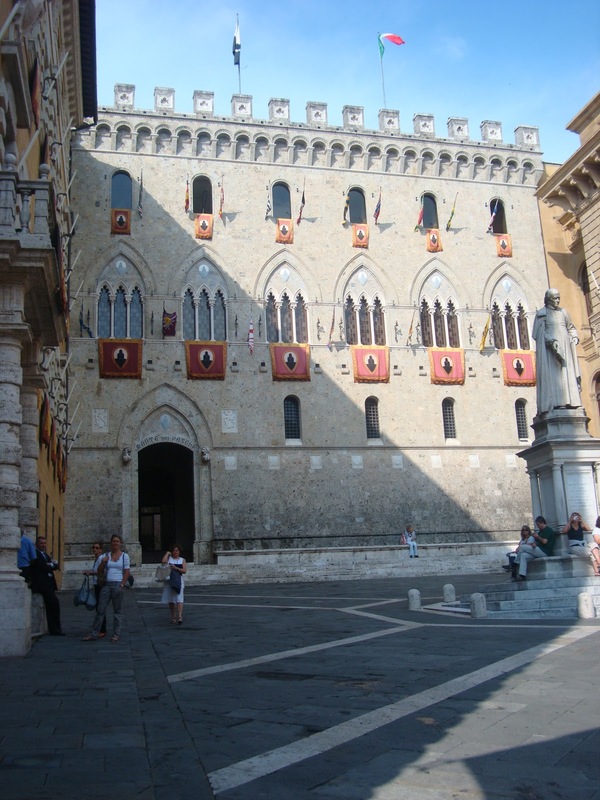 He won the Palio! We ate with the winning contrada! They didn't race until the next day so we didn't know at the time. 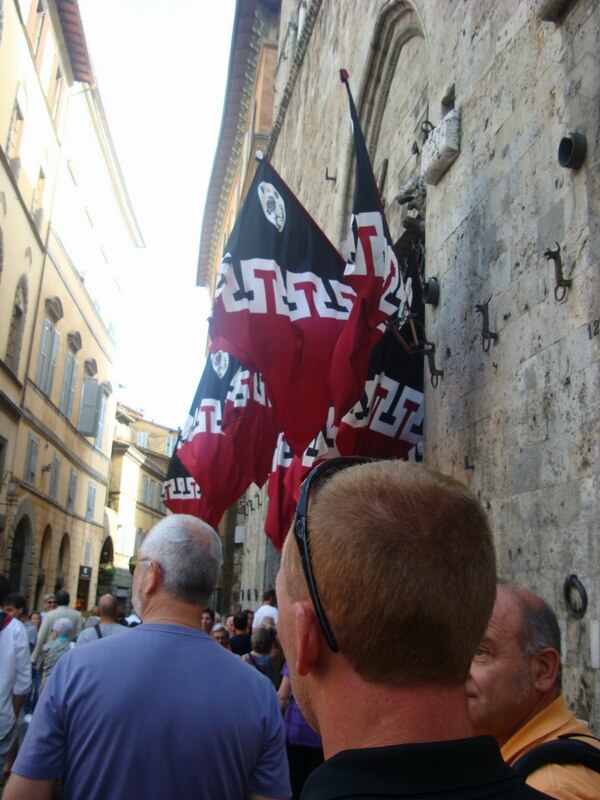 I looked it up and this contrada has the most wins of the Palio overall. 62 wins! Here is another video of a group of teens/ older boys singing. We were very full and excited about the evening. The walk back up that hill was KILLER! Once we got back to the hotel, we were so tired and jet lagged! What a good night's sleep we got! 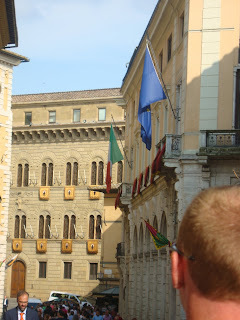 Since this is a long post, I'll break it up... the next day was very full of information and photos because it was the day of the Palio race. I will post that one soon!